South Tyneside Council is responsible for the management of the foreshore including both Sandhaven and Littlehaven beaches. Dogs are excluded from Sandhaven beach between the hours of 8am and 6pm during the period 1 May to 30 September each year. A person in charge of any dog contravening this Order will be guilty of an offence and liable to a fixed penalty of £80 (reduced to £50 if paid within 7 days). If the fine is not paid, the Council will prosecute at Magistrates' Court, where those found guilty of committing an offence can be fined a maximum of £1,000 (current rate). Whilst it is appreciated that some dog owners will control their animals properly and like to exercise them in the area, there have frequently been incidents associated with dog dirt, and the object of this Order is to protect and enhance the quality of the Blue Flag bathing beach during the tourist and holiday seasons. If you have a complaint or enquiry, please contact the Customer Contact Centre on 0191 427 7000. The Council operates a launching ramp on the River Tyne adjacent to South Shields Sailing Club off Harbour Drive. You will need a licence and appropriate insurance. Sandhaven beach in South Shields has Blue Flag status as well as the Seaside Award from leading environmental charity, Keep Britain Tidy. 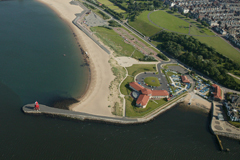 For more information about Sandhaven beach, go to Visit South Tyneside: Sandhaven Beach. To hire out water-bound pleasure crafts (including sailboards, rowing boats, canoes, motor boats, pedallos and larger boats) that are for personal use or carrying passengers, you may need a licence. Go to Pleasure boats licences.